Just Pass The Offering Plate! As a kid, I grew up in a Baptist church. This meant that hymns were sung, nice clothes were worn, and traditions were observed. I don’t remember at what age exactly (I think I was still in elementary school), but my parents decided to leave our church. After some searching, our family ended up at a non-denominational Calvary Chapel. Side Note: Now for those of you who are not familiar with Calvary Chapel, Calvary Chapel was born out of the 1960’s Jesus Movement. Think of it as the perfect blend of hippies and the Bible. Which is to say Calvary Chapel was about as far from my traditional Baptist upbringing as possible. Now, each Calvary Chapel is different. Each church has it’s own unique blend of people and culture. For instance, some of the churches pass the offering plate; others have “Agape Boxes” at the back of the sanctuary to place your tithe in. I say all of this to show that I have come from both sides of the tithing/offering spectrum (I currently attend a Southern Baptist Church that passes the plate weekly). 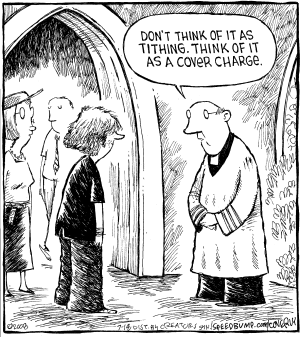 I have never thought of tithing or passing the offering plate as a cover charge to enter the church. Allows the giving of tithes and offerings to become a part of the worship service. For me, I’m not looking around at what others are and are not giving. I am simply giving a portion of the money that God has chosen to bless me with back to Him. Also allows for the church community as a whole to obediently give to God together. Not in secret. Not in the church lobby using credit/debit card kiosks to conveniently swipe in secret if at all (talk about enabling people who are already in debt). The plate, for me, often is a gentle reminder as to whether I (read: my wife) have written the tithe check or not. Ultimately, I believe that this is a matter of personal church preference that has nothing to do with the core Gospel message. Whether you have “debit kiosks” or a traditional plate, neither is a crutch or somehow more holy. Giving to God is giving, period. No matter what the method.